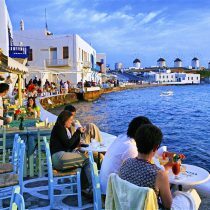 Mykonos is considered as the most cosmopolitan spot not only in Cyclades, but also in Greece. 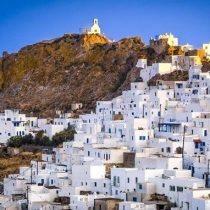 A picturesque town, amazing beaches, the vivid nightlife and the gay-friendly attitude are only some of the things you will appreciate in Mykonos. Lately, even more Greek weddings are organised on the island. Greeks but also many travellers from China, Europe and USA appreciate the cosmopolitan attitude of the island and decide to have a wedding in Mykonos, which proves the popularity of the island all over the world. Serifos is a small, authentic, untouched and wild island in the Cyclades island complex, which is located in a close distance to Athens (only 2 hours by boat). This is why the island is an excellent destination for a short summer break, and why the Athenians choose it for weekends or even daytrips. 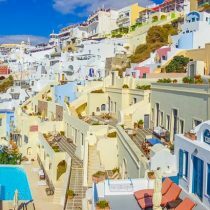 Santorini is one of the ultimate, romantic and amazing getaway choices for unique vacations. This small half-moon shaped Cycladic island has everything you may ask. Beautiful and breathtaking views, stunning hot and colorful beaches, folklore villages and an amazing Mediterranean architecture. It is an island with more churches with blue domes than houses. An island with more cute donkeys than hospitable people. An island with more Dionysian wine and alcohol than water. An island like no other.